Solution: Replace the lawn with drought-tolerant grasses, then add young trees and a paved area beside the front door. Wherever a desert landscape gardener finds herself—in southern Nevada or California, in Arizona, New Mexico, or Texas—she is working with a very special mixture of soil, water, sunlight, air, cold, and heat that offers challenges and unusual opportunities. The challenges are often dramatic and therefore frequently mentioned. The desert is hot. The desert is windy. The desert is dry. True, It is all of these things and more. But if you let yourself be inspired by your surroundings and forego any attempts to create an east coast or non-desert landscape design, deserts actually provide fantastic opportunities to show off regionally appropriate design. One fantastic example, seen here, is this Phoenix, Arizona front yard. The owners ditched the non-desert adapted lawn and replaced the area with drought-tolerant desert grasses and young trees. A sleek hardscape of concrete pavers leads the way to the door. 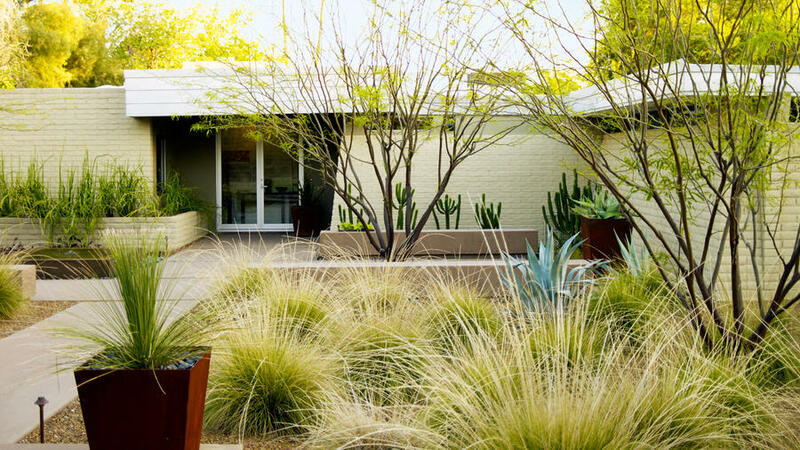 It’s important to take design cues from the jewels of desert landscape design. Be sure to visit the Desert Botanic Garden in Phoenix, the Arizona-Sonora Desert Museum in in Tucson, the Denver Botanic Gardens, and the Santa Fe Botanical Gardens. In low desert areas, consider Chilean mesquite, willow acacia, desert willow, shoestring acacia, ironwood, African sumac, and Palo Verde. In the high desert, try incense cedar, honey locust, Arizona ash, or honey mesquite. In the low desert, try bougainvillea, chaparral sage, cape honeysuckle, and deer grass. In the high desert, reach for mahonia, Damask rose, and salvias. In the low desert, reach for coastal ice plant, damianita daisy, and desert marigold. In the high desert, grab English lavender, cup flower (Nierembergia hippomanica), California poppies, and cosmos. In the low desert, grow barrel cactus, desert spoon (Dasylirion wheeleri), Agave Americana, or prickly pear (Opuntia). In the high desert, yuccas are your best bet.